Her teammates provided the necessary run support in the third inning. With two outs they loaded the bases against USA’s starter Jennifer Hunter, who had given up just one hit all tournament prior to the Gold Medal Game. However she wasn’t as sharp as usual and hit Yuki Kawabata with a pitch to force in the first run of the contest. One batter later RBI leader Yukiko Kon came through with a two-run single down the right-field line, building up the 3-0 score. This was the last time either team scored and Japan closed it out for the victory. The United States threatened in the seventh to come back, but with the tying run at the plate a groundout ended the game and started the celebrations. Earlier in the afternoon Canada had won a high-scoring affair 17-13 against Australia to capture the Bronze Medal. Venezuela finished fifth, Chinese Taipei sixth, the Netherlands with their first win internationally got into seventh and Cuba had to settle for eighth. During the closing ceremony the awards were given out and the All Star Team was announced. Yukari Isozaki was named Most Valuable Player, Best Pitcher Win-Loss and best Starting Pitcher. Tamara Holmes of Team USA received the leading hitter trophy. 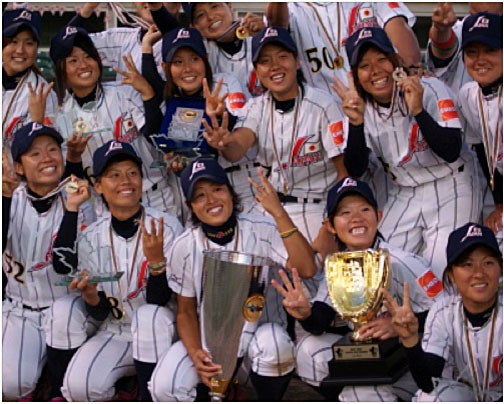 Follow the V Women’s Baseball World Cup on www.ibaf.org, Facebook and Twitter. The Gold Medal Game and the Closing Ceremony was streamed live on YouTube and will be available as video on demand.